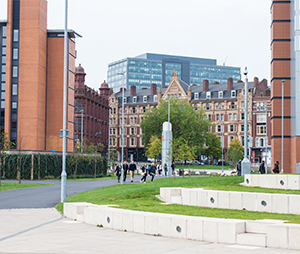 Aston University, Birmingham, is transforming security and safety with the introduction of SafeZone® for students and staff on campus and those travelling globally. The SafeZone solution, from CriticalArc, will put users directly in touch with the university’s security control room using their mobile phone, enabling them to request help, trigger an emergency response, receive rapid notifications in the event of emergencies and benefit from a wide range of customer-care services. “While some alternatives offered individual features that were attractive, none of them combined all the functions and benefits in the way that SafeZone does,” he says. The technology works by letting Aston’s control room operators pin-point the locations of individuals who elect to check-in using a simple app on their smart phones, including staff, students, service users and members of the security team. This app makes it easy for students, staff and school’s using the system to communicate directly with security responders, calling for help, asking for advice, reporting suspicious activity etc. And in return security teams can send out alerts and safety instructions to groups or individuals, in specific locations, as individuals or by specified user type. Notifications can range from helpful advice to alerts regarding specific threats. The benefits of SafeZone bring together features found in an assortment of systems – including lone-worker protection – making them available in a unified, scalable package. There are also new options for users to collaborate with the growing global network of SafeZone system operators. At Aston University stakeholders such as the students’ union, staff and department heads have been fully engaged in the roll-out of the new system. With the ability to ‘geo-fence’ any location in the world that has a signal, the university’s security team will now extend the same level of customer care and safety monitoring to all users, whether they are on campus, in accommodation blocks or associated sites around the city, or working abroad, says Darren Chalmers-Stevens, Managing Director EMEA and APAC for CriticalArc. For more information on CriticalArc and SafeZone go to www.criticalarc.com or email contact@criticalarc.com. Stay up to date with news and information by following CriticalArc on Twitter and LinkedIn.